Precision Micro increases sales 25% as it looks to achieve ambitious turnover target one year ahead of plan. (Birmingham UK, May 2018) With all cutting-edge disruptive technologies, there is a tipping point when it moves from being appropriate for niche applications to becoming appropriate for mainstream use. Such is the case with chemical etching. Often viewed as a niche metal manufacturing technology, in recent years chemical etching has experienced an exponential acceleration in uptake across all industry sectors and across all geographies where there is a demand for precision metal parts and components. Precision Micro has been at the forefront of developments in chemical etching for over 50 years, and as a company is experiencing this massive acceleration in uptake first hand, showing impressive year-on-year growth, allowing it to make further investment in research and development, plant and infrastructure. Its recent investment programme has proved to be one of the keys to the increased uptake of chemical etching across industry, as Ian McMurray, Managing Director at Precision Micro explains. Precision Micro is able to etch the widest array of metals in its industry, including those often deemed too difficult or requiring an insurmountable level of investment to process. A £0.75 million investment in its titanium etching capability in 2014 has opened up previously untapped market potential for the company, which is reflected in its impressive growth figures. 2016-2017 saw a 25% increase in sales to £15 million, driven not only from a buoyant automotive sector for which it is a leading supplier of burr-and stress-free safety critical flexures and high-end vehicle interior trim, but across the board, key applications including lead frames for reed relays, medical implants for CMF surgery and resistive heating elements for aircraft ice protection. The company is now on course to achieve its £20 million turnover target by 2019, one year ahead of plan. What is particularly impressive is that Precision Micro’s growth over the past five-years has not been achieved by constantly expanding its customer base, but by building strong partnerships with its existing, loyal customers, who are using chemical etching to gain competitive advantage and in-turn achieve growth. 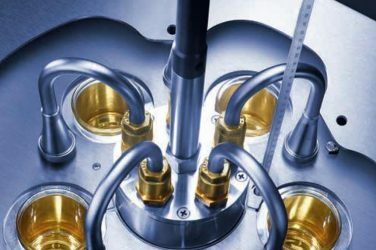 This fits very well with Precision Micro’s position in the chemical etching sector, being regarded as a strategic partner rather than a job shop that bolsters activity by securing one-off business from a huge number of OEMs. “Precision Micro’s positions itself precisely to cater for the demand from its customers. We recognise the drive for precise, complex, and safety critical components with more and more exacting tolerances and from increasingly difficult to machine metals, and so we invest heavily in being able to fulfil these requirements. It’s a two way street. We push the boundaries of the technology, this allows it to be used for a wider array of applications, and we benefit from the opportunities that we have helped to open up,” concluded Mc Murray. 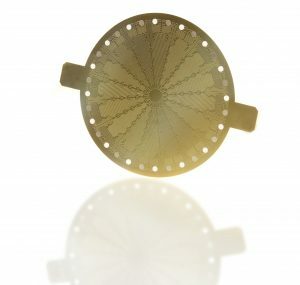 Chemical etching uses low-cost digital photo-tooling, photo-resist and etchants to chemically remove selected areas of a metal sheet, burr-free, stress-free and to tolerances measured in the 1/100mm range. But changing demands from customers and the complex nature of the etchant chemistry behind the technology has led to Precision Micro developing and executing its ambitious investment plan. In 2018, the company plans over £3 million of capital expenditure, the largest since its 44,000 ft2 purpose built plant was opened in 2007. As well as a new pre-cleaning line and automated optical inspection systems, the company will also be investing in a new ERP system, a new dedicated new product introduction (NPI) etch machine to reduce customers’ time to market, and significant infrastructure investment as it continues to meet upturn in demand and ensure best in class environment, health and safety (EH&S) compliance. As chemical etching secures its position as the “go-to” technology for OEMs looking to source complex, precise, and cost-effective metal components, Precision Micro is well placed to meet growing customer demand and maintain its position as Europe’s market-leading supplier. For over 50 years, Precision Micro has pioneered chemical etching. The company has won a reputation as the industry innovator, trusted to deliver by major global manufacturing concerns across multiple markets.